mydoTERRA.com Top-of-the-line essential oils and wellness products that I recommend. “Our ancestors had to go to some rather extreme measures to keep from getting lost. They used landmarks, maps, and the sky to help them find their way. Navigation is much easier today. For less than one hundred dollars, you can get a pocket-sized gadget that will tell you exactly where you are on Earth at any moment. As long as you have a Global Positioning System (GPS) receiver and a clear view of the sky, you’ll never be lost again. So exactly what is the Global Positioning System? It is actually a constellation of twenty-seven Earth-orbiting satellites (twenty-four in operation and three extras in case one fails). The orbits are arranged so that at anytime, anywhere on Earth, there are at least four satellites “visible” in the sky. A GPS receiver’s job is to locate four or more of these satellites, figure out the distance to each, and use this information to deduce its own location. We thought that this system is a great word picture to illustrate the concept of navigating your way to success in business and in life. 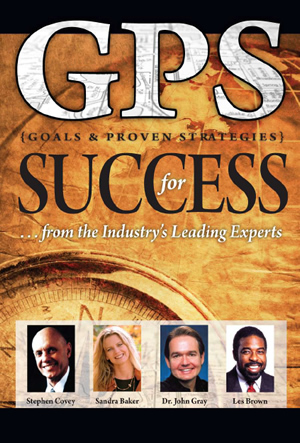 We’ve changed the acronym—GPS—and for the purposes of this book, it stands for Goals and Proven Strategies. These elements are vital for success. The search was on. We wanted to find interesting speakers/authors who believed they had valuable information to contribute regarding this important topic—and we succeeded. Each chapter provides a unique insight into this concept. I think you will find this book to be extremely helpful and an excellent addition to your library. GPS to Success belongs in the home of everyone who wants to know how to navigate the sometimes bewildering path along the road to success. A rewarding experience awaits you. And it begins with this book”. Order the printed and autographed by Sandra Baker version of GPS for Success – 202 pages (ISBN 978-1-60013-750-1) for only $19.95. NOTE: Within 24 hours of payment, you will receive a Link, Username and Password to download audio files. This journal is designed to assist you in consciously moving forward every day and creating an amazing life. It is divided up into sections so that you can easily access information. 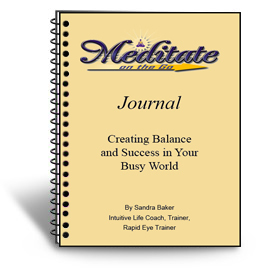 The first part of the journal gives you instruction on how to use the journal and how to clarify your ideal life. 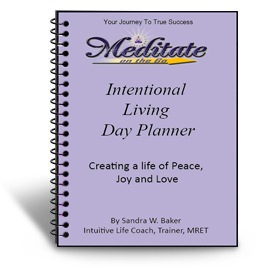 It is designed to assist you in creating your life intentionally. It breaks down all the different areas of your life to make it easy to get specific on what you want and start creating from that place. The daily pages have an area for intention, gratitude and emotional awareness and daily affirmations. It also gives you some “to do” things to mark off each day such as looking in the mirror and expressing love to yourself, using your imagination, reading good materials. Each are simple to do, but by doing them you can significantly improve your day to day living. There is a section to record your dreams to help you interpret them. Pages at the back provide space for note taking. Here is a sample page of the Journal. This is an awesome tool that I recommend for everyone! Here is a sample page from the Planner. Comfort was created to bring recognition to the emotions of loss and grief. So often, words do not fully describe the pain that we are feeling. The first piece of the Comfort CD reaches into the heart and makes a bold statement that this is how I am feeling. Each piece thereafter was placed in a specific order with the ability to bring the body back to a comforted, peaceful state depending on the intent of the individual. 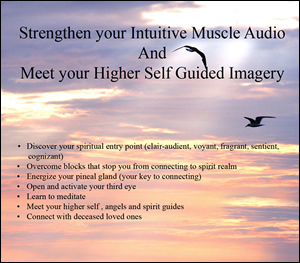 As one continues to listen to the CD, the body is given tools that will help lift the emotions as the individual is ready. 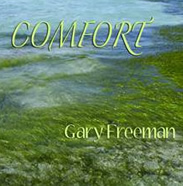 Gary Freeman has created acoustic piano and electronic textures to create a wonderful relaxing experience. The Seven Basic Chakras are presented with the last piece being a compilation of the minor chakras. Perfect for massage or quiet reflection. Its non-intrusive melodies gently and skillfully coax your soul to open. Deeply healing and uplifting. Wonderful background music for opening and closing meditations. Total length: 53 minutes. 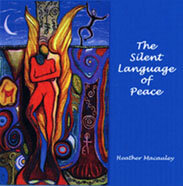 SAVINGS: Include “The Silent Language of Peace” (below) and pay only $35.00 for both! If you want to experience peace in the world, you must learn how to actively feel peaceful throughout the day. You must find peaceful ways out of conflict. If you want to see a harmless, loving world, you must be harmless in your actions, and conversations with yourself and others. SAVINGS: Include “Children of Light” (above) and pay only $25.00 for both!